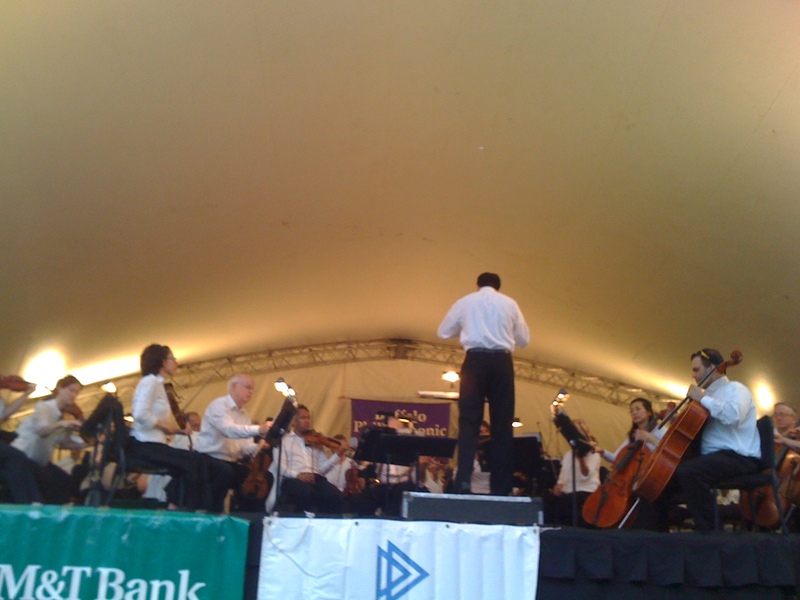 Tonight we went to hear the Buffalo Philharmonic Orchestra playing in the city, on Bidwell Parkway. 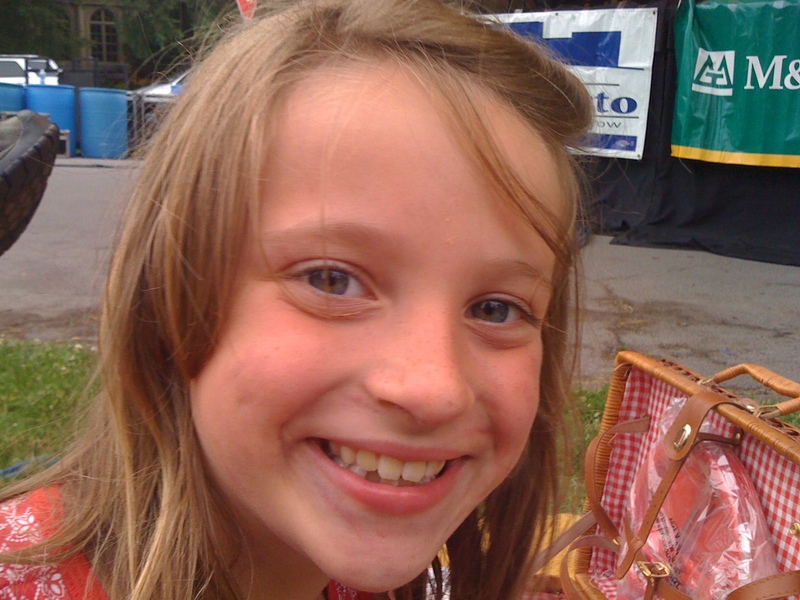 A picture of my niece Barbara. 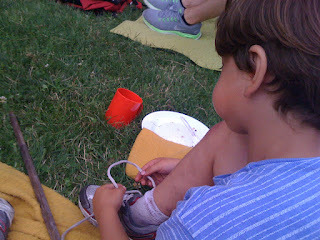 And my nephew Georgie, trying to learn to tie his shoes. Ha, ha! He was puffing his cheeks out, he was concentrating so hard. Both kids were good about listening to the BPO. They have inherited their aunt's abilities to remain motionless through long pieces of classical music! Georgie liked Aaron Copland's "Simple Gifts." He knew it from Mass as "Lord of the Dance." He was singing along! I heard him go, "Dance, then, wherever you may be." And he said to me, "I know this song!" So cute. We brought this really cool picnic basket that is visible to the right of Barbara's face up above. This basket, it was funny, before we went to the concert, Barbara asked, "Do we have a picnic basket to take?" And I saw this basket in the dining room, next to a box of Leonard Pennario records. I said, "Yes, Bar, we do!" And this basket, it killed me. I remembered buying it at a garage sale with my mom. My mom said, and she was right, that it would be a great present for someone. That was what I intended, to give it as a present to someone. But I never did. Most of my girlfriends have fall or winter birthdays. It just works out that way. Other than that, I just forgot. Now here was this basket. We opened it up. Barbara said, in delight, "Oh!" It was beautifully fitted out with four red cups and four red plates and red silverware. Everything was just so perfect. Both of us were gaga, looking at it. You can see one of the red cups in the picture up above of Georgie tying his shoes. My mom was right. It was a present. For me! We packed up homemade bread and cheese from Albrecht Discount and the strawberry jam I made from strawberries from the Clinton-Bailey Market. And a bag of radishes. "Oh! Radishes!" said Barbara. She is in that magical phase when everything is wonderful. I want to see the world like that!